VUE’s i-Class Integrator Systems proved to be the right solution for UMC Vista. 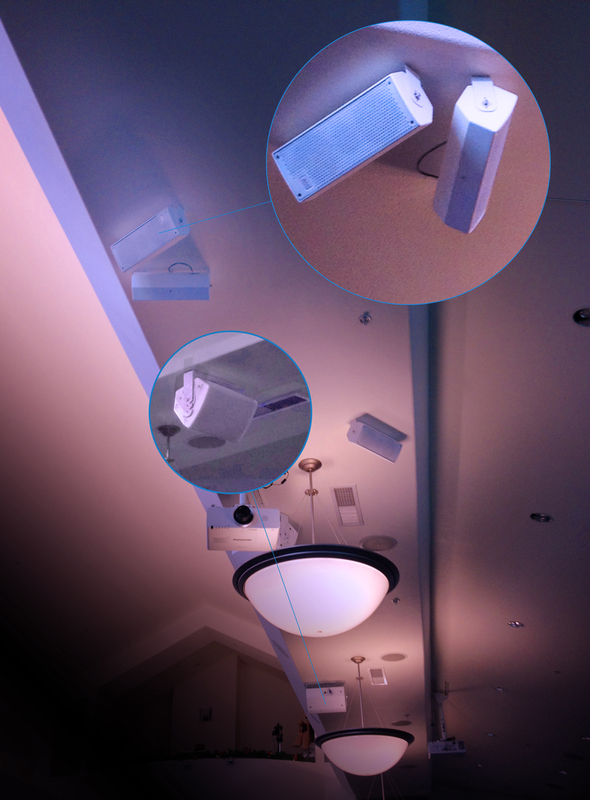 Four VUE i-8 Compact Full Range Foreground Systems and two i-2×4.5 Surface-Mount Foreground Systems were hung on the ceiling between the fixtures, directed down toward the congregation seating area. The i-8s and i-2×4.5s provide consistent, even coverage across the congregation area without spilling sound toward the fixtures, causing unwanted sonic reflections. 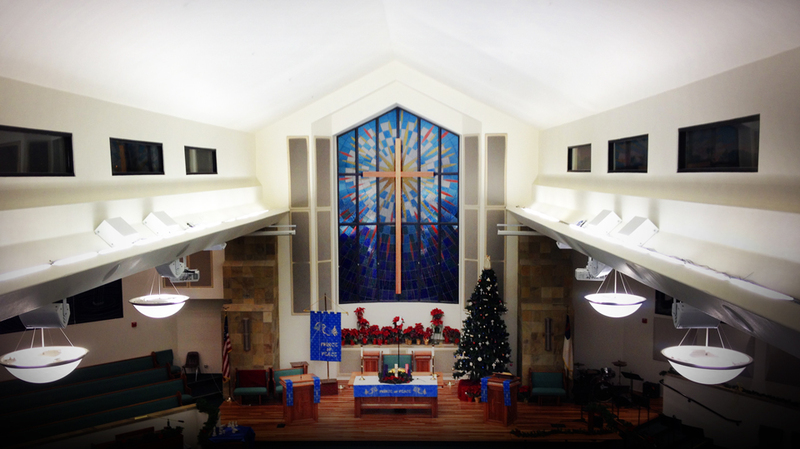 UMC Vista’s sanctuary accommodates 550 worshippers in traditional pews-style seating. Located on either side of the altar are large drop-down video screens used with two ceiling-mounted projectors during services and for presentations. The positioning of the screens ensures clear sightlines for the entire congregation while allowing the altar to remain uncluttered. Since the new audio system would also be ceiling-mounted, Sound Image needed to work around the projectors as well as the chandelier fixtures — all of which would remain in their respective positions and could potentially cause interference for the sound system. All VUE i-Class (integrator series of loudspeakers) combine professional-grade components in real wood enclosures, offering audio contractors a high-performance alternative to sub-par plastic-box speakers. The i-8 features an eight-inch polypropylene low-frequency driver and a one-inch, silk dome tweeter, with a 60×60 degree coverage angle and a maximum long-term output of 111 dB SPL. Included with the i-8 is a variable-position yoke mounting system, enabling the cabinet to be easily surface mounted and precisely angled for the desired coverage. Each i-2×4.5 features a two 4.5-inch woofers and a one-inch, ferrofluid, silk dome tweeter. The drivers are in a MTM configuration for symmetrical coverage interfaced to a high-quality crossover, enabling the system to deliver a frequency response from 90Hz to 20kHz (+/- 3 dB). The i-2×4.5’s angled enclosure facilitates installation in corners or on flat surfaces using the included mounting hardware. Recessed Phoenix input connectors make connection to both the i-2×4.5 and i-8 simple. In the case of UMC Vista, four VUE is-26 Compact Surface Mount Subwoofers are used to extend system response down to 48 Hz. The is-26 incorporates dual 6.5-inch LF transducers in a high-density wood enclosure that features integrated hang points. Capable of handling 220 watts continuous power, the is-26 can deliver a maximum long-term output of 118 dB SPL while weighing in at only 22.5 pounds. The church uses three additional VUE i-2×4.5s for choir and platform monitors. Other equipment employed in the new system includes an Allen & Heath mixing console, Shure wireless microphone systems, QSC power amplifiers and Symetrix signal processing. Barrel™ Sound Diffusor panels from AMD Acoustical Material Distributors, Inc., were installed to improve venue acoustics, providing a combination of sound reflection and absorption for increased intelligibility. The results have clearly been favorable.